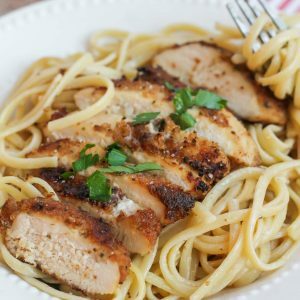 This Chicken Scallopini is a delicious dish of crusted chicken over lemon butter pasta. The flavorful, butter chicken and pasta combo is irresistible and perfect for dinner any night of the week. While pasta is cooking, heat about 1 TB of oil and 2 T. butter in a large skillet. Coat chicken in breadcrumbs and saute in your skillet, turning until brown and cooked through. Remove chicken from pan. In a medium pan, heat lemon juice and chicken broth on medium heat. Bring to boil. Reduce to low-medium heat. Add cream and simmer until mixture thickens. Slowly add your butter until incorporated. Add pasta to lemon butter sauce. Season with salt and pepper. Add cut chicken over pasta. Garnish with parsley and serve.